For many of the objects in the collection at Waddesdon we do not have any record of their purchase. This means that in order to research their history and ownership we need to look at records held outside the Waddesdon collections. This is why the recent discovery of a collection of receipts for objects bought by Miss Alice de Rothschild was so exciting. They still need to be fully transcribed but provide details of who Miss Alice was buying items from, how much she paid and when she bought them. There is also information about restoration, cleaning or reframing work that she asked for, and evidence of objects being supplied on approval. There are receipts which reflect typical Rothschild family collecting interests, including paintings, enamels, pieces of maiolica and Sèvres, but also more unusual categories such as arms and armour and smoking pipes, and they relate to several European art dealers. They cover the period 1904 to 1918 and provide us with a snapshot of the types of object Miss Alice was buying during this period and how she was buying– for example during the period of the First World War she stopped using art dealers on the continent, concentrating instead on those based in London. She was buying for all her properties. The receipts refer to objects being sent to Waddesdon and Eythrope, to 142 Piccadilly in London, and to the Villa Victoria in Grasse, France. Some of those sent to Waddesdon were to fill the spaces in the Bachelors’ Wing resulting from Baron Ferdinand’s bequest of his Renaissance collection to the British Museum. Others were to be added to her own collections. Suzanne de Court, Placque depicting The Annuciation, 1600; Waddesdon (National Trust); acc. no. 3163.1. There is further work to be done to identify where the objects listed in the receipts now are but some of them are still on display in the Smoking Room and Armoury Corridor in the Bachelors’ Wing at the Manor. 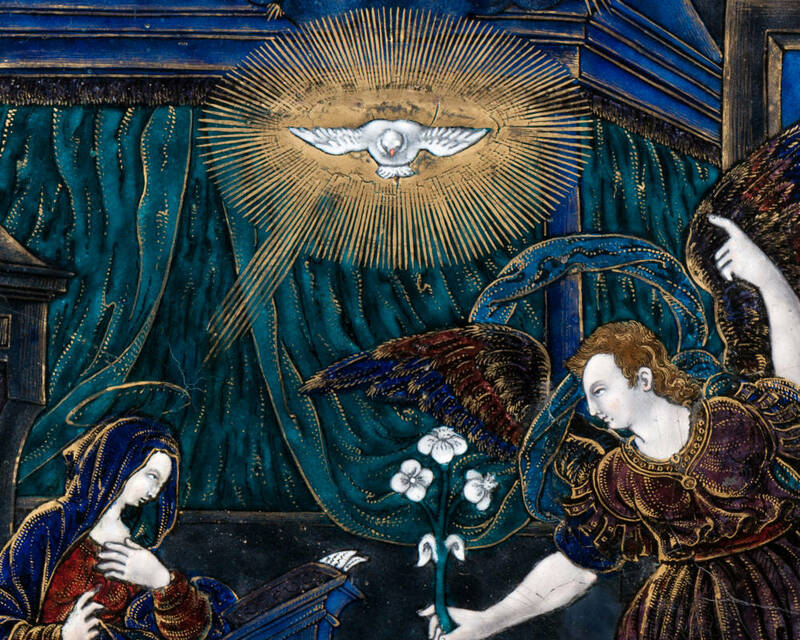 One of these is a late sixteenth-century Limoges enamel plaque by Suzanne Court depicting the Annunciation of the Virgin Mary in beautiful colours. This was one of a pair Miss Alice bought from Durlacher Brothers in New Bond Street in August 1917. 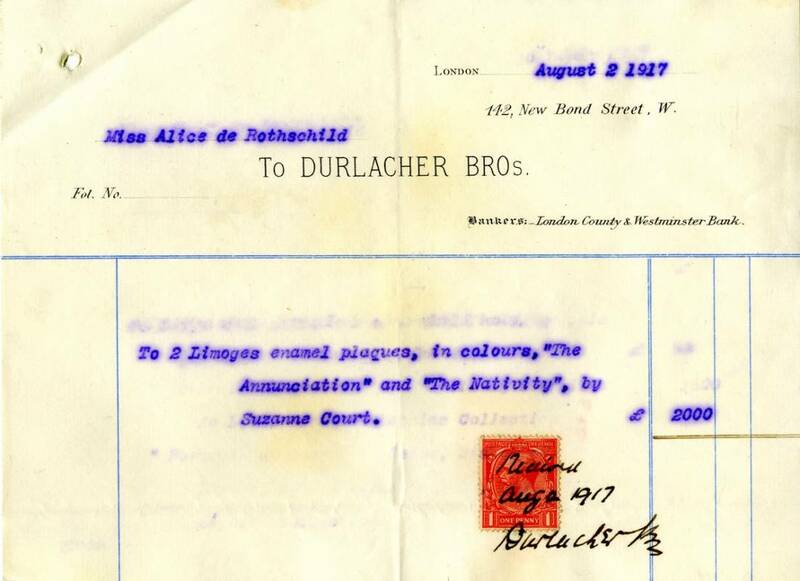 The receipt for the Limoges enamels from Durlacher Bros © National Trust, Waddesdon Manor. The receipts are interesting because they provide us not only with details of the history of the objects themselves but also because they give us information about Miss Alice’s spending habits and taste. Plans are afoot to transcribe and publish the complete set.